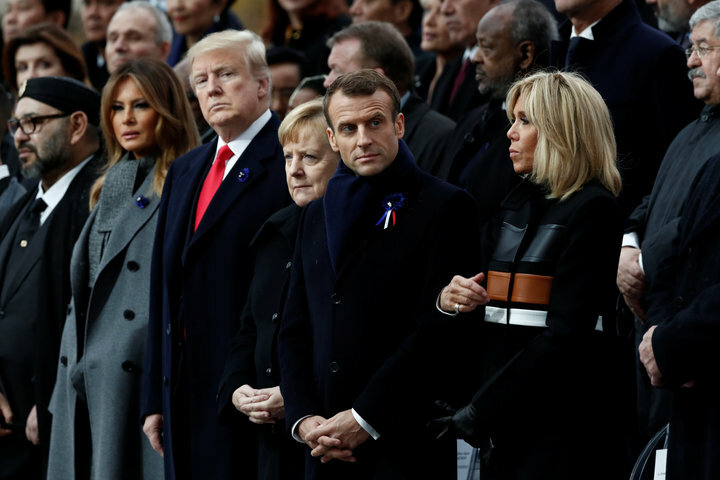 World Leaders Gather in Paris for the 100-Year Anniversary of WWI Ending: World leaders gathered on Sunday at the Arc De de Triomphe in Paris to mark the 100-year anniversary of the armistice that ended World War I. The historic moment was commemorated in a somber and rain-soaked ceremony led by French President Emmanuel Macron at the Tomb of the Unknown Soldier. U.S. President Donald Trump, Canadian Prime Minister Justin Trudeau, German Chancellor Angela Merkel, Russian President Vladimir Putin and UN Secretary-General Antonio Guterres were among the dignitaries present. During the ceremony, Macron in his remarks warned of the dangers of nationalism and the fragility of world peace. “The traces of this war never went away,” he said, referring to the Great War ― as it was known at the time ― being fueled in part by a rise in nationalism among Europe’s leading powers. Battle for Hodeidah Continues: At least 43 Houthis have been killed in Yemen’s flashpoint city of Hodeidah over the past 24 hours as pro-government forces close in on rebel-held areas in the east of the city. Hodeidah, a large city on Yemen’s Red Sea coast, is the latest battleground between the Houthis and the Saudi-UAE alliance which has been fighting for control over the country for the past three and a half years. Since November 3, there have been more than 200 air attacks reported in the city, with the AFP reporting at least 400 dead fighters. The United Nations has put the civilian death toll at 23 and has said that about 445,000 civilians have been internally displaced. Fires in California Intensify as Death Tolls Rise: The most destructive wildfire in California history leveled nearly the entire city of Paradise as firefighters battled massive fires on both sides of the state. At least 23 people were killed in Butte County, authorities said. Most of the buildings in Paradise are in ruin and its business district is destroyed. Only a day after the Camp Fire began, the blaze had destroyed more than 6,700 structures, almost all of them homes. Authorities said there were 110 people still missing. Central American Migrants Resume March Towards U.S. Border: Hundreds of Central American migrants resumed their march north through Mexico on Saturday, en route to the U.S. border where President Donald Trump has effectively suspended the granting of asylum to migrants who cross illegally. “It doesn’t matter what rules (Trump’s) government imposes we cannot go back to our countries. I have a bullet in my arm and another in my shoulder. If I go back home, it’d be better for me to go with a casket,” said 30 year-old Julio Caesar from Honduras, who declined to give his last name. Brittany Brown recaps last week’s midterm election. The New York Times estimates that some 114 million ballots were cast this year, well above the 83 million votes cast in 2014 and 91 million ballots cast in 2010. New York City’s holiday season has begun! Grab a cup of hot cocoa at the city’s holiday outdoor markets at Union Square, Bryant Park and Columbus Circle, beginning November 11. Click here for more information regarding locations and times. On Broadway: The Radio City Christmas Spectacular | A yearly tradition since 1933, this classic Christmas spectacle offers tap dancers, a flying Santa Claus and, of course, the world-famous synchronized precision dancing of the Rockettes. Shows run from November 9, 2018 through January 1, 2019. On your plate: Kiin Thai | “We wanted to bring the comfort of a home-cooked Thai meal, matched with a cozy atmosphere, to New Yorkers so they can experience the real cuisines that you would find as if you were living with a local Bangkok family.” — Supanee Kitmahawong, Owner. This week’s Monday Briefing is brought to you by Zuha Siddiqui.